WAKEFIELD, Mass. - A record 73 alumni of the Hockey East Association will start the 2018-19 season on National Hockey League rosters, reestablishing the bar for the most alumni on NHL rosters on opening night for the seventh season in a row. The number also nearly doubles the 44 alumni who suited up in the NHL on opening night in 2011. Hockey East alumni on NHL rosters to start the season represent 11 different schools. Boston University sends 15 players for opening night, while Boston College boasts 13, and Massachusetts claims 6 NHL players. Maine, UMass Lowell, and New Hampshire each send five, Northeastern and Providence have four, and UConn and Vermont each have one alumnus skating in the NHL today. Additionally, four former Notre Dame skaters who spent time in Hockey East also appear on NHL rosters. 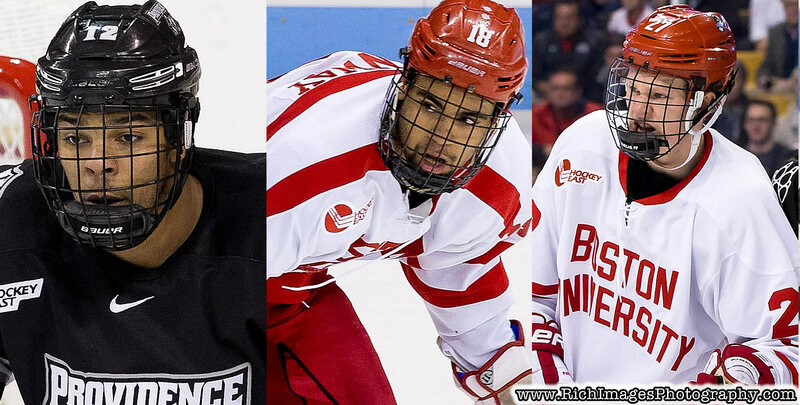 Three players that skated in Hockey East in 2017-18 were named to an NHL club as Boston University’s Jordan Greenway (Potsdam, N.Y./Minnesota) and Brady Tkachuk (St. Louis, Mo./Ottawa) and Providence’s Erik Foley (Mansfield, Mass./St. Louis) will all start 2018-19 at the game’s highest level. Hockey East alumni are featured on 28 of 31 NHL teams. ABOUT HOCKEY EAST: The Hockey East Association is an 11-team Division I college men’s hockey conference founded in 1984 and a nine-team Division I women’s league which began play in 2002-03. The men’s league has won nine NCAA championships in the past 25 years including Providence College in 2015 at TD Garden in Boston. Since 1999, Hockey East has won seven NCAA Championships with 15 NCAA Championship Game appearances, while placing 25 teams in the Frozen Four and 68 teams in the NCAA Tournament during that time. Overall, Hockey East has sent 112 teams to the NCAA Tournament since its inaugural season, more than any other conference in that span.